The new season of The Simpsons continues after a one week pause, and this Sunday, November 8th, 2015, Fox aired “Friend with Benefit”, the 6th episode of Season 27, and the 580th episode to date. This Episode Fact File will recap the episode with pictures, video clips and more. Get the scoop right after the jump! 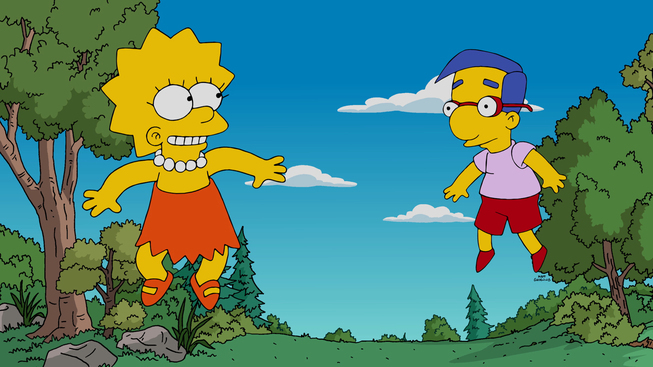 Episode Details: ‘Friend with Benefit’ is the 6th episode of Season 27 as well as the 580th episode of The Simpsons. The episode aired on FOX on November 8, 2015 and was written by Rob LaZebnik and directed by Matthew Faughnan with Al Jean as the show runner. Homer is watching TV when he sees an advertising for a self-lifting chair. He gets interested in buying it, but it costs $1,100, so he goes to Moe‘s Tavern to get some ideas to raise money. Lenny and Carl give him the idea for crowdfunding. He records a failed video for a website, which moves almost everyone in Springfield, so he gets enough money to buy a chair in almost no time. Meanwhile at Springfield Elementary‘s club sign-up day, Lisa is trying to get signatures for The Magic Club, when she first meet Harper, who appears interested in joining the club because it was the only one that doesn’t creep her out. Lisa shows interest in her new friend, discovering that she’s also a pretty talented magician. When the Springfielders realized that their money was spent on such a useless thing, they formed a mob and went to the Simpsons’ House to burn the chair down. At night, Homer gets angry about the chair, complaining that he never gets the finest things in life. That’s when Lisa asks him to take her to an Australian boy band concert with Harper, as her father has bought the seats. Feeling unconfident, he takes Lisa to the show. At the sports arena, he is surprised when he’s given platinum with stripes VIP wristbands. That’s when he first meets Harper‘s dad. They discover that they also have a lot of things in common, and that Harper‘s father is extremely rich. On their way back home, Lisa complains about how Harper didn’t let her say a word at the show, so Homer tries to convince Lisa to keep her as her best friend. That’s when Harper invites them to see a David Copperfield presentation. At the show, once again, Harper didn’t let Lisa participate while their fathers were enjoying the good time together. So Lisa gets even more upset with Harper while Homer enjoys his great friendship with Harper‘s father, who invites the family to spend a week at their private island, but they can’t go as the kids have school. That’s when Skinner calls the Simpsons, saying that school next week has been canceled. Later, Harper gives Lisa a gift: a new bicycle, but Lisa doesn’t accept it for the emotional values of her old bike. This makes Harper mad, and soon it evolves into a discussion and they decide to end their friendship. As they wouldn’t go anywhere, the family gets angry at Lisa, but Homer realized that he and Harper‘s father were still friends, so they could go to the island. At the island, the family’s fun is ruined when Harper and Lisa fight once again, so Homer has to make a hard decision: continue being friends with Harper‘s father or go home so Lisa can be happier. He decides to leave the island and go home, saying that Harper is “kinda spoiled” and that she doesn’t deserve Lisa. On the plane back, after seeing all the stuff they left behind on the island, they realize that Bart was still there. RECEPTION! : The episode was watched by 3.48 million viewers. COUCH GAG! : Short with Santa’s Little Helper titled Feast and changed to fat. He gets fed by the family till he becomes fat and is sent to the Springfield Retirement Castle, where he’s fed strained prunes and dies afterwards. He’s greeted by God. He sees the Fit Dog Heaven but God sends him to Fat Dog Hell where a signs says free pizza. The title of the episode is reference to the the phrase “Friends with Benefits”, which means two friends who have a sexual relationship without being emotionally involved. “Undercover C.E.O.” is a parody of the television franchise series Undercover Boss. Homer buys the Seat-to-Feet Lift Chair thanks to Crowdfunding on a site called FriendMoocher. Homer and Marge mention “Crocodile” Dundee and its third movie Crocodile Dundee in Los Angeles. Homer’s Pechanga Casino Buffet bracelet refers to the Pechanga Resort and Casino. J-Cloud is a parody of iCloud. Making your decision with Dr. Phil. The scene where Homer get out of the water is a reference to a scene from the Bond movie Casino Royale. Homer and Harper‘s dad sings Under the Mango Tree by Diana Coupland. The movie Back to the Future was shown on the island while the Simpsons were leaving. The couch gag is a reference to the 2014 Disney short film, Feast. The music heard during Seat-to-Feet Lift Chair’s “funeral” is “Lacrimosa” from Mozart’s Requiem. The song played during the introduction of Harper‘s dad in the box is “Sirius” by The Alan Parsons Project. Two members of the Australian boy band are named after Australian towns. Wodonga and Macquarie are named after Wodonga, Victoria and Port Macquarie, New South Wales respectively. The look of the Magic Palace where David Copperfield performs is like that of the Magic Castle in Hollywood. During Doe-Eyed Boys they mentioned the Nobel Prize. In a screen behind them it appears photos of Albert Einstein, Teddy Roosevelt, Mother Teresa and another unidentified laureate. Doggie Heaven was previously claimed by Homer to be the place where Santa’s Little Helper will go after death in “Dog of Death“. The French Kissing Club is a reference to Edna Krabappel‘s French Kissing Booth in the comic “Midday on the Midway“. Harper‘s father mentions that Jambowski island was formerly Haiti. Lisa says she has to pedal backward to go forward on her bike, but in every past episode where she rides her bike, the pedals worked normally. When Homer, Marge and Bart are preparing for the trip, Bart is flipping a flaming stick with a brown shirt. But when Lisa comes in, Bart‘s shirt turns blue. Milhouse wouldn’t be able to take Harper‘s bike to himself. The bike is equipped with a modern anti-theft device, so riding the bike would draw Chief Wiggum‘s attention and possibly get him arrested. The squats Homer watches on TV show incorrect form: the knees should not extend past the toes. 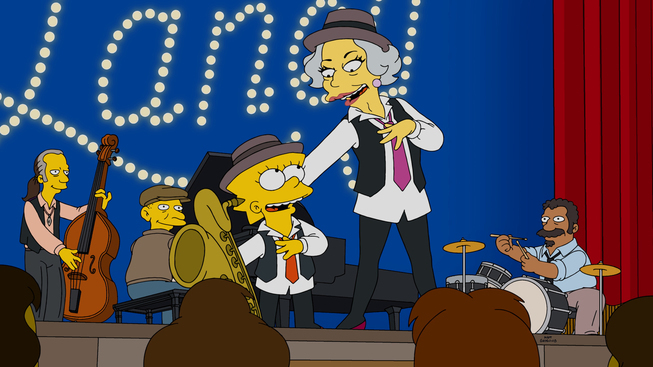 This pictures and videos are from the “Friend with Benefit” episode of FOX show The Simpsons. Their use is believed to qualify as fair use under United States copyright law. I believe the scene where Homer get out of the water is a reference to a scene from Dr. NO, the first Bond film made, where Ursula Andress comes out of the water in a white bikini. Previous Treehouse of Horror 2015: Last 24 hours for Act 2, Drive-In Theater and Sepulcher of Evil. New items in the store!